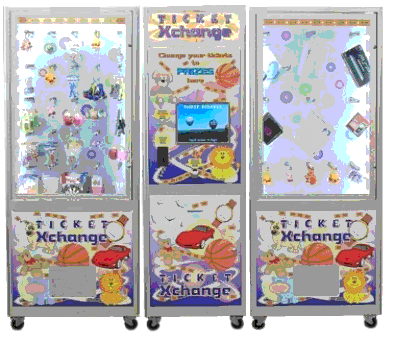 Customers feed tickets into the Ticket Xchange, the tickets are counted and shredded with the count displayed on the LCD Touch screen, the customer has the option of selecting a prize or storing the Ticket count onto a Members Card for later use. Customers can use the member's card to accumulate points for higher value prizes (no need to carry around huge bundles of Tickets and receipts). This creates repeat customers that you may not have had before! 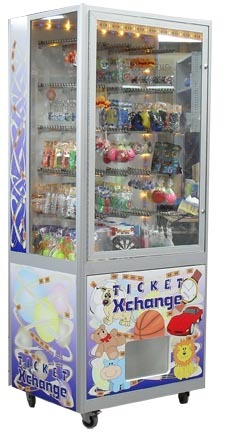 The Ticket Xchange machine will allow you to put many different redemption games into locations where they couldn't go before. It also gives you the option of hooking up to 8 Prize Dispensing Cabinets together for the maximum quantity and variety of prizes. This unit is the has the Ticket Eater/Counter where players feed in their won Tickets. Options are selected by the touch screen in easy to understand instructions and pictures. This unit holds all of the different Prizes for the player to select from, various configurations are available, Base model has 25 spiral dispensers and each spiral can hold 20 prizes, Giving a massive 500 Prize capability in one unit. Of course you can connect up to 8 Prize dispensers to one Main Control console. So much more........please call or email for more information.